I saw this on my Facebook feed and couldn't resist sharing! 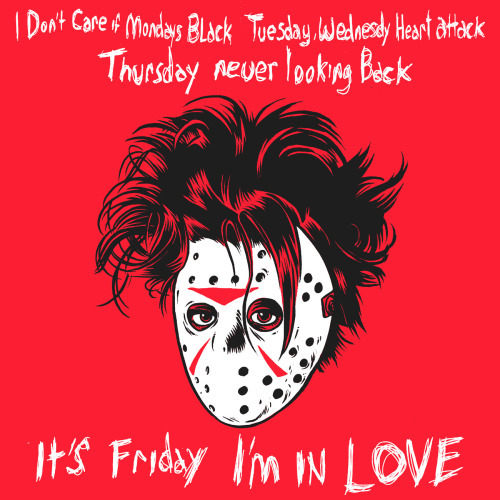 "It's Friday the 13th I'm in Love" Jason Vorhees/Robert Smith of The Cure mashup by artist Craig Horky! I mean, how absolutely perfect is it?! UPDATE: Check out other Summer Goth Essentials on my 2018 list and 2017 list! Summer is swiftly approaching here in the Northern Hemisphere and temperatures are already inching up into uncomfortable territory (I can't stand anything over 75 degrees Fahrenheit; yes, I'm a delicate little flower). Though summertime means that Halloween is right around the corner, we still have to get through the sweltering days, which can be a challenge for those of us that prefer dark and dreary to bright and cheery. So, to help cope with the impending sunshiny doom, I've put together a survival list of 20 summer essentials for dark hearts like myself. Most of these items are for spooky ghouls (sorry boils) and include creepy clothes, sinister swimsuits, boo-tiful bags, macabre makeup, and more. These are all items I either love or covet, I have not been paid to post them. Also, everything you see is vegan and cruelty-free. And I think it goes without saying, but ALL BLACK EVERYTHING (ok, with a few exceptions)! I hope these 20 items keep you cool and creepy this summer!